Five strong female dancers took The Theatre Centre BMO Incubator stage in an abstract contemporary dance number that was both physically demanding and also quite intense. Choreographed by well-known choreographer Amanda Acorn, the SummerWorks production multiform(s) was a fluid, dynamic piece that showed a great deal of willpower and endurance. It is always fun to walk into a theatre and be welcomed in by the performers already dancing on the stage. One of the movements that caught my eye was a repetitive motion with their heads and necks that had a sort of whiplash feel to it. Even though the movements looked simple, the difficulty of moving the head and neck back and forth required a lot of focus and strength. I know if I was doing that particular repetitive movement I’d be paying a visit to my massage therapist right after! Although it sometimes looked like it was all improvisation, there were moments in the piece that the dancers came together as a group and moved in sync. I loved the surprise element of the choreography. I never knew what to expect. For the most part, the dancers performed non-stop, taking only one brief breather on the dance floor. I think it was in that moment I took a breath as well. I could feel the exhaustion from all that movement! What I particularly enjoyed was the live sound by Germaine Liu. Liu walked from corner-to-corner of the theatre, playing unique and mysterious sounds. In particular, the look of concentration and intensity in her face was what lured me in. I would have loved it if she was on the main stage itself and not behind or on the side of the audience. Even though I am personally more drawn to story-telling in performance, I can appreciate the physicality and commitment this performance demanded of the dancers. 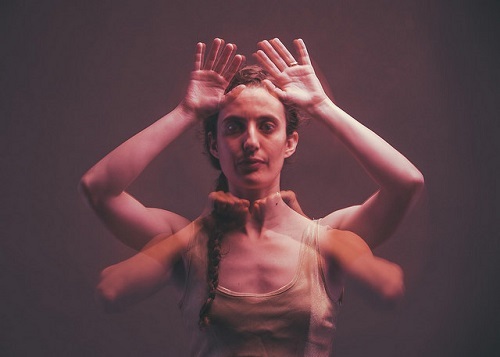 If you enjoy beautiful abstract contemporary dance, than check out multiform(s) at SummerWorks.